Tamsin came into our Cambridge studio with her own beautiful star ruby and asked us to design a striking pendant. 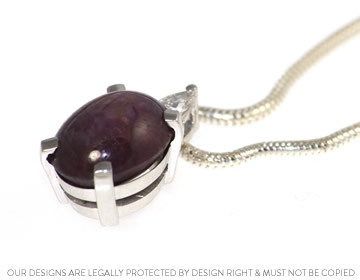 The 18ct white gold pendant features Tamsin's own 12.5 x 10mm star ruby held in a four claw setting. Set above the ruby and held in a 3 claw setting is a new 5.2 x 3.2mm(0.21ct) H VS pear cut diamond, which also becomes the bail of the pendant. To complete the look the white gold is rhodium plated, adding a bright white finish and to complete the look the pendant is polished to a high shine. 9ct rose gold pendant with the customers own stones.